Minotaur Rescue (a.k.a. “Solar Minotaur Rescue Frenzy”) is Llamasoft‘s (i.e. Jeff Minter’s) first game for iOS. It’s available as a universal app which natively supports iPhone and iPad device configurations. The game is part of the “Minotaur Project“, a series of games modelled after the design sensibilities of different eras of computer hardware, but unbounded by the cost and technology-driven limitations of the real hardware of the time. 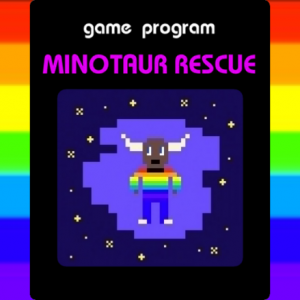 Minotaur Rescue purports to be a game made for the fictional “Ataurus TVC 2605”, a device which has the graphical output of an Atari VCS, the text overlay of a Commodore VIC-20, and the ability to render a seemingly unlimited number of sprites, particles and feedback effects without slowdown, thanks to Llamasoft’s NEON engine. The gameplay is most easily described as a mash-up of Asteroids and Space War. The player pilots a small, constantly-firing triangular ship around a toroidal area of space (i.e. a single screen which wraps at the X and Y boundaries). The ship is controlled via an ingenious ‘virtual trackball’ interface. Gently stroking anywhere on the touchscreen sets the heading and acceleration of the ship. This allows for rapid lunges across the screen as well as more subtle steering. I expect that other top-down iOS games will quickly adopt this input method. Waves of space rocks spawn at the edges of the screen and drift around in random directions. Shooting a rock causes it to explode, spawning a smaller rock and occasionally a minotaur. (Debris thankfully doesn’t multiply as in Asteroids, as this would quickly become unmanageable in such a small playing field.) Minotaurs need to be rescued (touched with the player’s ship) before they fall into the sun. The closer the minotaur gets to the sun, the more points are awarded. The first dozen or so minotaurs that are rescued also incrementally increase the base firing rate of the ship’s gun. Finally, there are several varieties of bonus UFOs which intermittently buzz the player, distracting from managing everything else that’s going on in the scene. The early UFOs are largely oblivious to the player, while the later ones (blue jets and red biplanes) tail the player while spewing instant-death fragmentation bombs all over the screen. As the game progresses, the amount of points awarded for shooting rocks and saving minotaurs (but not dispatching UFOs, oddly) gradually ratchets up. With all of these systems in play, the player’s strategy settles into a simple pattern. The top priority is defending the sun, as the length of the game is the largest single factor dictating your potential final score. The second priority is rescuing minotaurs. Early in the game it’s worth taking extreme risks to save as many minos as possible, thereby fully upgrading your weapon. Later on, as the sun expands and the screen gets busier, it’s not always possible to save every minotaur in time. The third and final priority is defending the ship’s integrity. You have three shields per life, and the more of them that you can keep intact, the longer you can potentially last in the random free-for-all of the black hole phase. Once the ship’s laser is fully upgraded, the most effective movement pattern (that I’ve found) is to make slow horizontal sweeps across the screen, skimming past the sun, and ‘waggling’ the ship gently so that it pees out lasers in a loose sine wave (something that may be familiar to Geometry Wars and Super Stardust HD players). This ensures that a large proportion of rocks (and UFOs) spawning from the East and West edges of the screen are immediately dealt with by shots crossing the screen boundary from either direction. The game has some problems. Firstly, the default game mode (“Solar Minotaur Rescue Frenzy”, with three lives and progressively more challenging set ‘levels’) is largely pointless. Starting at level 1 results in a lengthy period of tedium before the difficulty ramps up, and starting at a later level gives a ‘starting bonus’ that is far lower than the typical score that can be obtained by playing from the start, needlessly handicapping the player. Beyond level 10, the difficulty (and frequency of cheap deaths) ramps up extremely quickly. The other main problem, which also affects Survival mode, is that the game’s level of randomness has not been tweaked to prevent needless time-wasting. As outlined above, the early part of the game hinges on rescuing minotaurs as quickly as possible to maximise your weapon power. Before your gun is maxed out, the rate of fire is too low to keep the screen clear of asteroids reliably after the first few waves. As a result it becomes drastically more likely to succumb to cheap hits as your ship is boxed in by asteroids (or even double-hits, as you’re pinged off one asteroid onto a collision course with another), and harder to stop debris falling into the sun. If the game decides it’s not going to spawn more than one or two minotaurs in the first few waves, it’s probably better to restart than to sit through the protracted low-scoring death spiral that will almost certainly result. Unless there are other (skill-based) factors governing minotaur spawning that I’m not taking into account, this looks like a very avoidable oversight. As well as the game modes already described, there are the multiplayer modes (up to 2P on iPhone and 4P on iPad) where each player uses a half (or quarter) of the screen as their controller. Also, there are a couple of simple bonus games (‘Tanks’ and ‘Jets’), which I’ve not tried (as I’m more interested in Minotaur Rescue’s merits as an arcade game than Atari 2600 nostalgia) but which seem to have been received unfavourably. Other than those previously mentioned, my only criticism would be that the pyrotechnics weren’t as impressive as I was expecting (although you can at least see what’s going on most of the time). At £0.59/$0.99, the game represents excellent value and provides many hours of almost completely frictionless, positive feedback-heavy gameplay.